Synopsis: In a dystopian not-too-distant future, black telemarketer Cassius Green discovers a magical key to professional success and is propelled into a macabre universe. After a music career that spanned over two decades, Boots Riley takes his first stab towards commercial filmmaking—taking the cake for the most rambunctious screenplay of 2018 thus far with Sorry to Bother You. The light handful of musically inclined artists who aspire to partake in the world of directing don’t always land the cleanest of transitions. Boots Riley in no shape or form falls victim to this. Seeing how high-strung and adamant he is about this project signifies the such scarce amounts of failure he’s been met with during the process of this film being made. Not only does he successfully create his feature debut, he sculpts something so principal in this age of film but still manages to occupy it with such inventive eccentricity. This should definitely make some waves come July, bet on it. The rumors that began to circulate about how truly bonkers this film is have been floating all throughout social media since it’s Sundance premiere. Even then, those don’t quite do the film justice. Despite prospering with its own uncanny originality, there’s a larger-scale assessment in the film about the ethics of going against socially tolerable norms mixed with an exaggerated portrayal of certain professional hierarchies standards. This produces such a sharp-witted and evenly balanced debut from Riley. While ideally it holds nothing back, it doesn’t set the bar too high for itself. Specializing in the care-free normalcy’s of modern life yet still focusing on the confliction of our protagonists. Even if it does so in the most flagrant way possible, as it can occasionally leap into an element of self-awareness at times. Nonetheless, it still burns brightly with its level of relevance—even subconsciously making fun of the fact that it’s taking itself seriously. Nearly any production containing a cast with Lakeith Stanfield or even Armie Hammer is bound to benefit from their overabundance of talent and increasing level of familiarity towards audiences. I’m not even accounting for the other distinct supporting cast members. There’s so many fresh and recurring facades pitted against each other in this production and story, all of which stem from such unique discographies yet maintain dedicated and committed to their role. In such cases that nearly every comedic attempt can genuinely thrive due to the cast’s radiance. The entirety of Danny Glover’s appearance and the hysterical implementation of trite stereotypes like “channeling one’s inner white voice”, is a sole example that I’m speaking upon in particular. There’s an obscene quantity of different gags/phrases thrown in that are as you would imagine, extremely humorous. And somehow all of that is due to the actors’ prowess and atmospheric presence. Simply one of the multiple departments of this film that the cast/crew flourishes in. There’s something quite unequivocally fresh that begins to sprout in each direction from this screenplay penned by Boots Riley. Disregarding it’s fairly light-hearted tonal nature, it’s proposition on weighty new-world issues and its depiction of those who want to dream big collide for our stirring plot escalation. Protagonist Cassius Green is a character so effortlessly identifiable with due to his universal ambitions of a better life, despite being shackled to the normalcy of early adulthood suburbia. It even goes as far as to test his morality once he’s achieved such high status. Has he executed what’s perceived as right or has he left his friends and family behind while on this path to an inhumane lifestyle? It’s all put in to perspective but I still can’t truly preach enough about it. Along with all of that and the short-analysis on society/media scrutiny, it makes for a kinetic piece of storytelling. I’ll be rooting for this heavily to grab a screenplay nomination later during this year’s race. As appealing to film lovers as Sorry to Bother You is, it isn’t exactly mutual for people who aren’t necessarily as passionate about cinema. General moviegoers might not be as fascinated in such a salacious story arc such as this one. It’s definitely not the most approachable feature for anyone to sit in a theater and watch this tale unfold. It has shades of satirical nature that it faintly co-depends on, but I can’t see a massive number of audiences connecting with the more brash and extensive allegorical themes. Therefore, they’ll just neglect it altogether without attempting to find anything beneath the surface. Which will then mount in to a domino effect for the lack of revenue/attention because of people’s disinterest. Anything is possible however. It’s definitely found it’s main demographic, it just becomes a matter of expanding upon that in to a more substantial audience now. 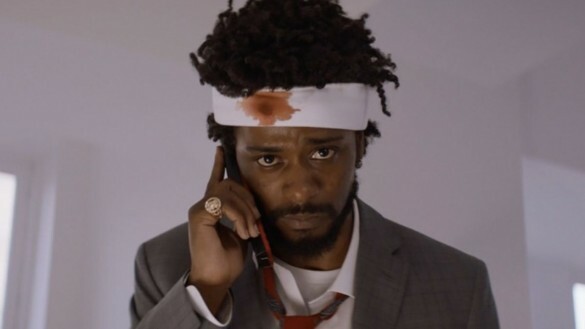 Sorry to Bother You is fabulously weird. One can’t help but adore its irreverence and boisterous style while taking content in its proclivity to tell a story. Hopefully it’s lack of narrative accessibility doesn’t tinge the project’s potentially deserving appraisal or lack thereof in those circumstances. It’s definitely not for everyone—even as much as I dislike using that term—it’s gonna provide a fluctuating array of consensuses once fully released. However, I can comfortably say it’s one of the most satisfyingly prevailing debut attempts from anyone as of late. Hear our podcast review on an upcoming Extra Film.